Years ago, when Ableton’s Operator FM synth designed by Robert Henke made its debut, it was a revelation. 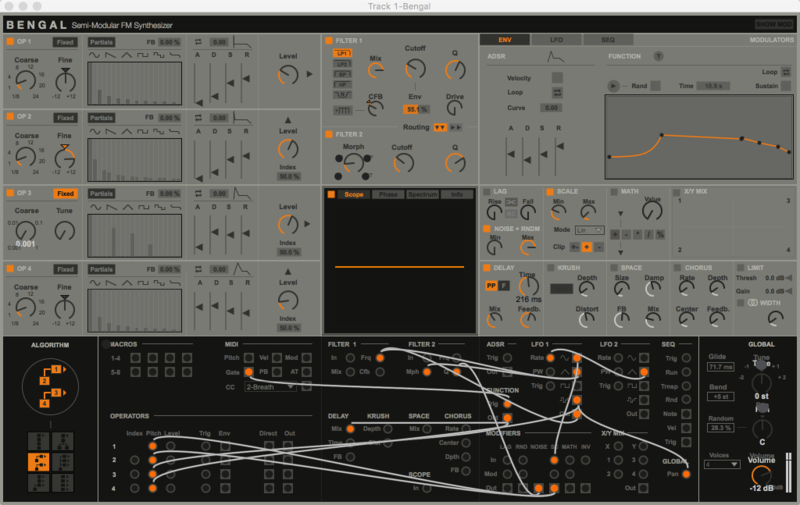 Its clear panel design and flexible architecture made FM synthesis more accessible to countless Ableton Live users. But now Operator, while still a great go-to instrument, certainly deserves some competition. And that makes Bengal special. The production of Max for Cats (and Christian Kleine, another key designer of Ableton instruments), Bengal also innovates in the area of clear design and architecture. And with a semi-modular design, it goes further than Operator in opening up avenues for creative sound design. The semi-modular idea is the key selling point. We’ve already seen live patching interfaces from Max for Cats. This time, you can use the patching metaphor to rewire the operators, filter, and other components in a ready-to-play instrument. As with Operator, Bengal focuses on four operators. This time, you can use a bank of 20 sets of sine wave partials which you can edit directly, or you can load one of 40 wavetables, or you can drag and drop your own samples to use those as wavetables. That flexibility alone should be a winner. But each operator also has additional features: independent ADSR envelopes with curve shaping and looping. The key to FM synthesis, of course, is then how you route the different operators. Here, you can use one of six algorithms, or patch using the patch bay. For the filter section, you get two multimode resonant filters. These also have different types – so in addition to lowpass, highpass, and bandpass, you get notch, comb with adjustable feedback, and the option of a Moog-style ladder lowpass. Each filter also comes with drive saturation and wet/dry controls. You can also route the two filters either in parallel or stick filter 2 after filter 1. Each LFO and each operator envelope (not just the sources, the envelopes) is available for routing to anything – even to the effects controls. So even calling this semi-modular perhaps belies how much is there. You just drag from source to target, as you like – and this being software, of course, you get patch storage and recall and never run out of cables. Once you’ve come up with your patching routing, you can also map to eight Macro controls on the Device – which in turn you can access from Push or other hardware controllers (like even my lowly Akai MPK mini keyboard, for example). Now, any software instrument can pack a lot of power – one of the advantages of working in software as a medium is that you’re constrained only by available memory and computational resources. So the measure is really making this all accessible. And I think the key there is making the structure clear on the front panel. There’s also visual feedback, with a selectable Scope, Phase, and Spectrum view for showing your signal and its frequency and stereo positioning information. This one looks epic. I expect to be spending a lot of my fall with this particular instrument, so expect more soon. USD 59 / EUR 49.